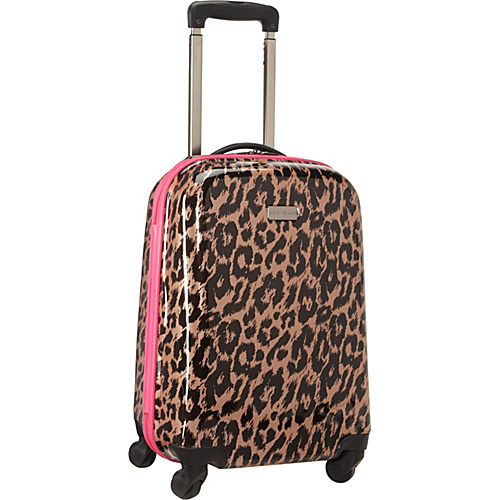 A wild Cheetah print adds a fashion forward touch to this chic spinner case from Betsey Johnson Luggage. The Betsey Johnson Luggage Cheetah 20″ Hardside Spinner case is constructed from ABS/PC laminate material and features a hardside design with an allover cheetah print pattern, colorful contrast accents, custom hardware details, a telescopic push button handle system, and four spinner wheels that offer 360 degree mobility. This spinner has a striped interior lining with criss-cross tie-down straps to secure garments in place, a small zipper pocket to hold accessories, and a zippered divider pocket that creates two separate packing compartments. A built in TSA lock offers security for all types of travel. Please Note: This hardside luggage comes with a protective plastic casing that is meant to be peeled off. This is not a defect.